Want to see the templates? Click here to check them out on our demo site! The Marketing Materials are reserved for dakis Online Photo Solution and/or kiosk users only, if you wish to sign up for these services contact sales@dakis.com today! Steps to adding your Logo and URL to your brochures. 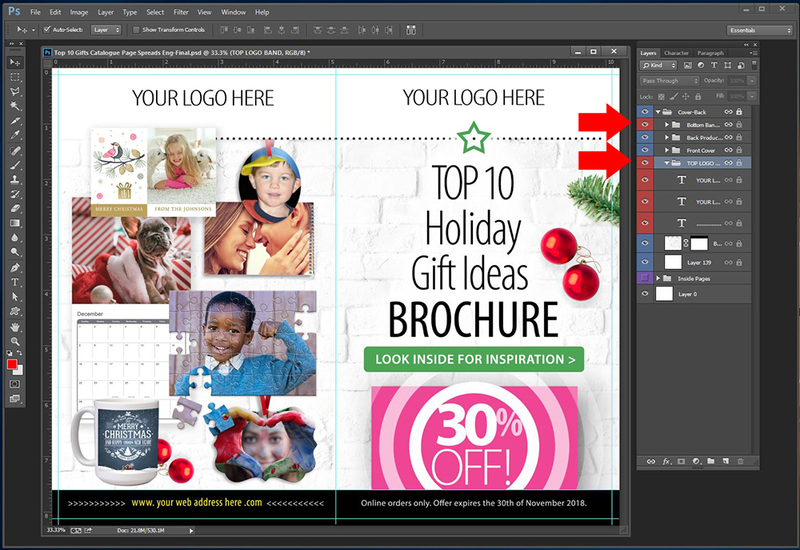 The print and web Top 10 Gift Idea Brochures are supplied to you in editable Photoshop Layers Files. The most important thing for you to personalize is your logo (branding) and your web address URL. Let's start by opening up your photoshop file for your print catalogue. Under the Cover Back Layers Group you will see the groups Top Logo Band and Bottom Band Text. Remove the YOUR LOGO HERE and replace it with YOUR LOGO under TOP LOGO BAND. Then edit the temporary address with YOUR URL under the layer group Bottom Band Text. Once you've done that save the Cover spread and overwrite the existing Cover-Back.jpg . Next open up your in design document with the extension .indd. Go to the Cover-Back Spread and replace the jpg with your updated file. 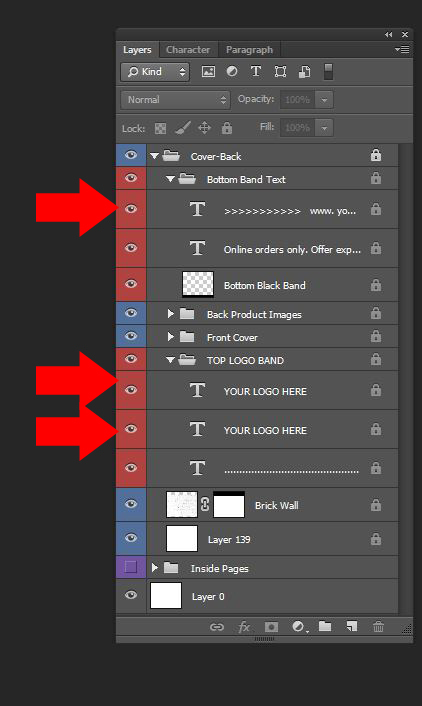 Do the same steps for the remaining 5 inside page spreads in order to add your logo to the top left hand of each spread. 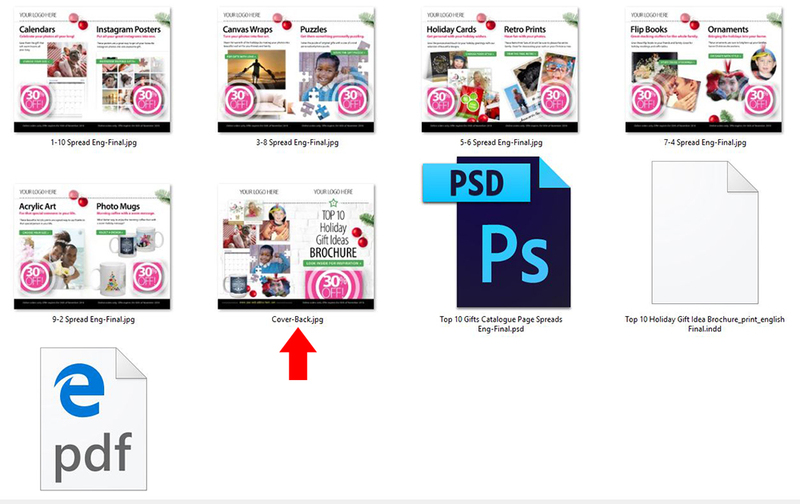 Now that you have replaced all the jpg spreads with your revised pages save your file and export it using the same settings. These steps can be used for both the web and prints versions. Make sure that your brochurer products have been activated before you send this request out. If you do not have a dakis website simply download the Marketing Materials. We've included all the files that you will need to create your own page. Make sure that your calendar products have been activated before you send this request out.